The present case has been reported in the journal Annals of Emergency Medicine. An 18-year-old man presented to the emergency department with sudden onset of shortness of breath and chest pain. The patient had caught a common cold 4 days ago and since then had developed night cough. He was a nonsmoker. He did not have any history of asthma or trauma to his chest. He had tachycardia (133 beats/min) and tachypnea (25 breaths/min). Oxygen saturation was 99% on room air. On physical examination, his neck appeared to be swollen, with crepitus on skin palpation. Chest radiograph and computed tomography (CT) were obtained. 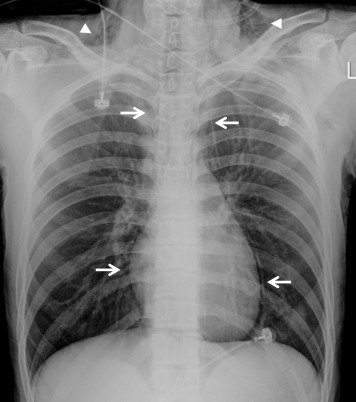 Chest radiograph revealed pneumomediastinum and subcutaneous emphysema at the bilateral lower neck. 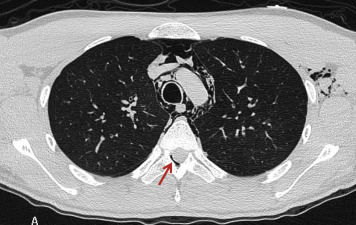 CT of the chest revealed air in the spinal canal and intervertebral foramen. 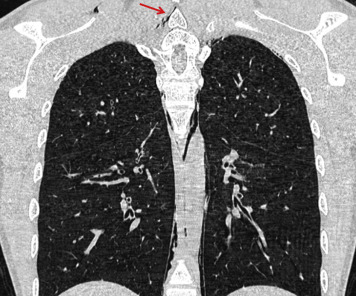 The patient was diagnosed with pneumorrhachis associated with spontaneous pneumothorax. The patient received conservative therapy and was discharged uneventfully. - Pneumorrhachis is characterized by air in the spinal canal. It is a rare entity, mainly resulting from an abrupt increase in intrathoracic pressure, caused by cough, asthma attack, and forceful vomiting in a healthy young adult. - Conservative treatments are often adequate for this condition because it is self-limited. - However, for pneumorrhachis of specific causes such as esophageal rupture, infection, and open trauma of the spine, more aggressive treatments should be considered.